Ask fellow campers about "Arrowhead RV Park" and nearby attractions. Probably one of the better parks in the Winnipeg area, but nothing really to do here (no pool, spa, game room, etc.). Big rigs are placed in a newer section that has no trees, grass or landscaping....just gravel. Great for satellite reception, but not very pretty. We wish they had placed the sites a little farther apart as it felt very close. The owners are nice and are always doing some kind of maintenance. They offer Wifi for a daily fee, but we still thought it was a little pricey for no amenities. We camped at Arrowhead RV Park in a Fifth Wheel. If you're going to Forks Market, park in an open air lot between Union Station and the Museum. Thanks for taking the time to review our park. Although we do not have a spa or pool, we do offer a variety of lawn games, including horseshoes and the little ones love our playground with swings, a play structure and sandbox with toys. Still, most of our clients do take advantage of our proximity to the city of Winnipeg. Thermea Spa, the Human Rights Museum, and the Forks are some of the places most enjoyed in our fare city. Let us know what you fancy, and we'll find something to match your interests! We do find that most of our 50 amp clients prefer no trees and really appreciate that all our sites are nicely landscaped to offer a very flat parking space and lots of room to navigate a big rig. You may wish to try a 30 amp site next time, which do offer some trees or a 50 amp site across the playground which makes a nice backdrop during your stay. Thanks again, and we hope that you'll stay with us again. 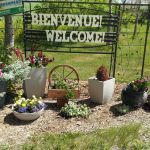 It is a short drive from Winnipeg, though the spots are close together the friendliness and cleanliness of the park, washrooms and laundry area more than make up for that. The owners and their staff are extremely friendly. I rate this park the best in the Winnipeg area. Make sure you phone ahead for reservations as it does get busy at times. The spots are lime stone base and are level and solid. We camped at Arrowhead RV Park in a Fifth Wheel. Thanks so much for taking the time to review our park and for the 9 stars! We do pride ourselves on keeping our park clean and up to date and strive to provide the best customer service for our clients. We sure hope you'll stop in again soon! Nice small park but pricey. At $47 CDN (less Good Sam discount), I would have expected wifi to be included but it is an extra $3/day for one device or $5 for two devices. One section is quite treed, the other is an open gravel lot making it easy in and out. Not all that attractive but understand the reason for no grass--limits mosquitoes. Sites are level but close together. Impeccably clean washrooms/showers. Small laundry area with 2 washers/dryers. Washing RV's allowed so that was a bonus. The park served our purpose and we enjoyed our stay. We camped at Arrowhead RV Park in a Fifth Wheel. Thanks for your kind review! 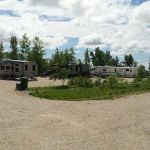 You’ll find that our RV Park is competitively priced as compared to other RV parks in the Winnipeg vicinity and in Manitoba. And yes, we do charge a nominal fee for our park-wide, in your RV, high speed wireless Internet access. 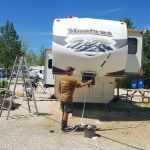 You’ll find that Internet access is few and far between in RV Parks in Canada and the fee we charge only covers the costs of maintaining the system for all to enjoy. The treed area you mention is our 30 amp section. We keep our 50 amp section treeless by popular demand for large rigs to make it easy to navigate. And, you're right! The full limestone does limit mosquitoes and other bugs and also provides a nice hard surface for RVs (a double-bonus)! We hope to see you again soon when you’re in the Winnipeg area. Well-run park a few miles south of Winnipeg. Basically a gravel lot with neighbors nearby. Everything works well. You pay for wifi but it is fast and can stream Netflix. Friendly hosts. We recommend. We camped at Arrowhead RV Park in a Motorhome. Thanks for taking the time to review our park! As you mention, we do have lots of limestone in our park as well as beautiful gardens. The limestone ensures a nicely compacted surface for RVs so that all our guests are high and dry when it rains. It also has the added feature of limiting mosquitoes and bugs! We hope that you'll stop by again soon. This is a very nice park just South of Winnipeg. The roads and sites are packed rock and the sites where we stayed we're level. High speed wifi is available for $3 extra dollars per device. The owners here were very friendly and helpful. Winnipeg is about 9 miles away and it is an easy drive there and back. We will definitely stay here when back through the area. We camped at Arrowhead RV Park in a Fifth Wheel. 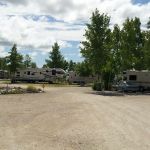 Thank you very much for taking time out of your day to review our RV park! We're so glad you enjoyed your stay with us and hope you had enough time to enjoy all the sightseeing and activities Winnipeg has to offer. We hope to see you again soon! Total gravel lot, full service but small tight sites. Close to busy road so heard lots of road noise. People very helpful and pleasant, location for access to Winnipeg is great, but not a location for relaxation! We camped at Arrowhead RV Park in a Fifth Wheel. Hello Konny, thank you very much for taking the time to review Arrowhead RV Park. As advertised, all our sites are limestone throughout. The main reason is that it ensures a good bed of rock for those heavy RVs and rigs, but it also guarantees that even with torrential downpours our sites are mud-free and as an added bonus, it keeps the pesky mosquitoes at bay. It is indeed the first time that someone indicates that there was a lot of road noise. Most of our clients have indicated that they stay with us because it's especially quiet in our park. We hope that you'll stay with us again should your travels take you near Winnipeg. Great little park, with owners that were trying hard to please. Not a lot of atmosphere, but we were here to tour Winnipeg. Would stay here again. We camped at Arrowhead RV Park in a Motorhome. Visit Canadian Mint and Zoo. Rate shown is in Canadian Dollars. Superb campground. Owners are extremely nice and helpful. They tend to all of your needs in a timely manner. They are very knowledgeable of numerous attractions for all kinds of needs. Even some off the beaten track. Wifi is blazing fast and works extremely well. Laundromat is spotless and not that expensive. Do yourself a favour and stay there if in the Greater Winnipeg area. We camped at Arrowhead RV Park in a Travel Trailer. Winnipeg has a lot of attractions for all kinds of needs. Don't be fooled by the lack of tourist information. Do a bit of research first and enjoy all Winnipeg has to offer (museums, history, etc.). St. Norbert Market is an awesome place to discover many local arts and flavours. Great family friendly park! The owners live onsite with their family and are extremely accommodating! There isn't many 'extra' amenities and the sites are close together, but the friendliness of the family makes up for that. There is a green yard area and play set that the kids enjoyed. The park is very quite too! Very much recommended! We camped at Arrowhead RV Park in a Travel Trailer. This is now our summer home, after being chased away from the only other park near Winnipeg by rude management and owners. The owners live onsite and bend over backwards to accommodate. In spring, when water lines are still frozen, owner will take a hose to each site to refill holding tank. As stated, there are not many amenities, other than friendliness. Came in early one year and he plowed out our site. Fire pits available, no extra charge for family to stay. We camped at Arrowhead RV Park in a Motorhome. Really nice park we have stayed at before. As previous posters have indicated, not much in extras but you won't find a cleaner, neater park anywhere. If you stay in the back/newer section the services can be a little wonky. Every second site has water and electric on the wrong side. You will get antenna TV and the sites are easy to access. Fuel in town but not much else. We camped at Arrowhead RV Park in a Fifth Wheel. Friendly owners that know what they are doing! They live on site and have camped enough to know what RV owners want and need in a park. Crushed limestone throughout (eliminates mosquitoes), WiFi cost $5 but was good. Bathrooms/showers were excellent. We highly recommend this one! We would stay here again. We camped at Arrowhead RV Park in a Tent Trailer. Thirty amp sites were a bit cramped. My door opened on to the neighbors waste drain. Other than that, the owner was very friendly and accommodating. We had issues with our trailer and he loaned us tools etc... Showers and bathroom were the best and cleanest I've ever seen - even better than some residential bathrooms! Would definitely stay here again. We camped at Arrowhead RV Park in a Travel Trailer. Very friendly owners. Great location about 20 mins from Winnipeg suburbs and useful shops. Quiet at night. The cleanest and nicest washrooms we have seen. Flat dry sites with some shade. Excellent WiFi. We camped at Arrowhead RV Park in a Motorhome. Winnipeg has a lot of attractions for all kinds of needs. Don't be fooled by the lack of tourist information. Do a bit of research first and enjoy all Winnipeg has to offer (museums, history, etc.). St. Norbert Market is an awesome place to discover many local arts and flavours. Are you affiliated with Arrowhead RV Park ?